Is it just me or is this year going by really fast? First quarter almost done!!! It’s the middle of the week and we have a new word to share on #WordSearchSeries. The aim is to bring a word to your attention if you do not already use it in making sentences or while speaking. 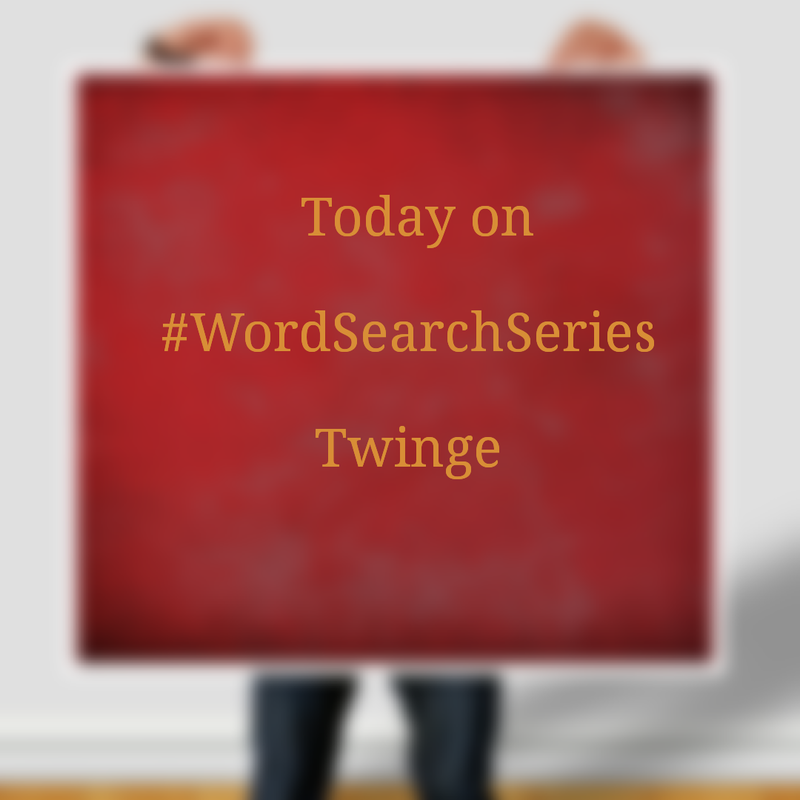 So today on #WordSearchSeries, the word I found is Twinge. How often do you use this word? In a bid to know a bit about bloggers in my line of sight, i try as much as I can to read your blogs and that was the intention when i clicked Arfa’s Blogging Book and then realized she actually runs two blogs ( i need such dedication). I randomly chose to read about morning routines that will make you feel great as I have been having subconsious conversations with myself about what being a ‘morning person’ means ( I know that I can be an early bird if I have an appointment which requires that I should be one, but i never wake up with the drink water, exercise, conscious meditation or write routine). There was a line in the article that had……..twinge of jealousy….I thought it meant ‘a bit of jealousy’ so i grabbed my dictionary to confirm. Example: Stop running if your tummy twinges. So there you have it, if this is not already a word you use, it can be added to your list. Thanks to Arfa for that piece about morning routines….I just might have a change of mind. Has it been effective for you in anyway? Do share your experience in the comment section as it might inspire me to have a change of mind. Honestly, i think routines can get a bit boring but if there are significant benefits, then I just might go all the way. Thank you for reading and if you enjoyed this piece be sure to check back next wednesday for a new word on #WordSearchSeries. Oh yes I have used Twinge before. It’s a part of my novel. Oh yes I have this morning ritual, where I wake up to see what page I ended up on last night while reading a novel (since I read on a daily, it’s kind of my job to do so). Then heading for the shower and preparing meal for the family. I’m not a morning person either, but since my son began kindergarten, I established this morning routine. However, I’m still not a morning person. I can’t wait for the weekend to stay in bed for just a bit longer. By the way, the word twinge is not one that I have ever used before. My morning routine is sacred! If it gets disrupted, my entire day can fall apart. I read somewhere that a good morning routine can set you up for success. I don’t know if that’s true, but I’m very sure if I didn’t have a morning routine, I wouldn’t be able to do everything I have to do! Not a morning person at all! Too bad work expects me to be prompt! LOL. Twinge…yup, I use that one. Jack and I turned 50 this year and we get twinges an awful lot these days! Twinge is a great word. I’m a massage therapist so hear it a fair bit. My morning routine depends on whether I’m at uni or work. In that case it’s get dressed, eat and leave. On days off itso eating followed by dog walking. Blogging is all about time-management but I have to keep the balance between my both blogs. Epife is where I share tips to grow businesses online and Arfa’s Blogging Book is where I throw out words from my personal life, experiences and definitely, knowledge. Paytea, you are a wonderful blogger and what you do others probably don’t make it possible. You are best at what you do! Your word series is really really amazing! Awww…..Thank you for the kind words Arfa. I definitely want to do better. Haha..I see we all love to sleep in a bit…but well, as long as we don’t leave really important issues unattended to. You really do manage both blogs well because they both have good content. Welldone!!! I’m appreciated to Phaytea of http://www.phayteaspulse.wordpress.com for mentioning my both blogs. By the way if you are looking for a word series, you should definitely check this out. Have a good day fellows. That’s Great Tinkara, you seem to stick to your routine pretty well too..hmmm…Do you go to bed early? On days when i sleep late, I allow myself have some more sleep time if I don’t have to leave the house early. But I guess having a morning routine is about starting your day early regardless of the previous night. I am another so-not-a-morning person! Seems like there are a lot of us. But I do have a morning routine – otherwise I probably wouldn’t get out of bed until lunch time! As soon as I wake and stumble to the little room, my darling well-trained husband brings me coffee and a rusk! While dunking my rusk and sipping my coffee, I have my morning devotions. (I’m sure the Lord understands the need for coffee while I’m talking to him!) Then I check FB on my phone before forcing myself out of bed and into the shower. Then, and only then, I’m ready to face the day. Usually. Previous Post Phayview #3: Let’s indulge in Mum Stuff.